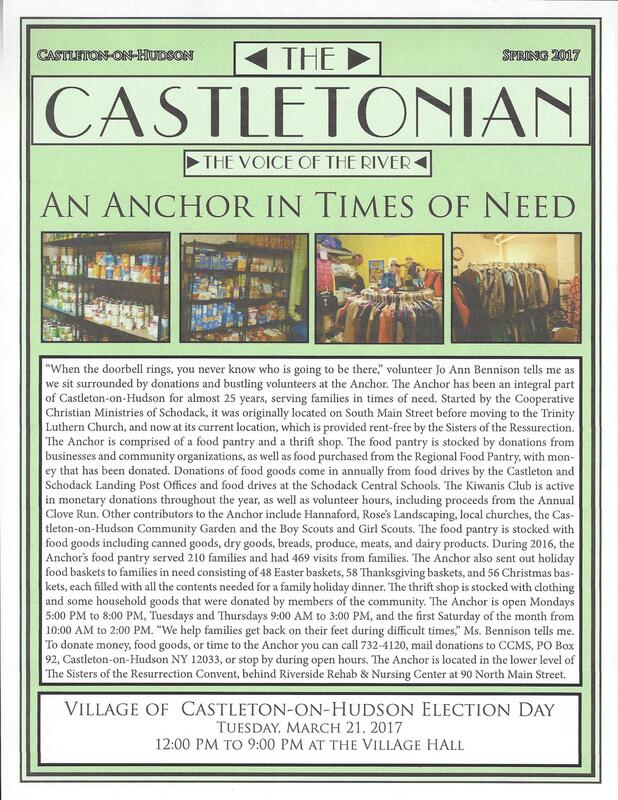 The Village of Castleton-on-Hudson election will be held on Tuesday, March 21, 2017 at the Village Hall from 12 Noon to 9 PM. Three candidates are running for two trustee seats: Marianne Carner, incumbent Sharon Martin, and Linda Underwood. Click here for candidate profiles. This week, due to today's (3/14) storm, trash and recycling pick up in the Village of Castleton-on-Hudson will be on Thursday, March 16 instead of Wednesday, March 15. In anticipation of the predicted snow storm, the Village of Castleton-on-Hudson will be under a snow emergency from 6 AM on Tuesday, March 14 to 12 Noon on Wednesday, March 15. Thanks in advance for your cooperation. Please Note: A Fire Flow Test will be conducted on March 9, 2017. Residents may notice some discolored water, reduced water pressure and should refrain from doing laundry on this day. Sorry for the inconvenience and thanks in advance for your cooperation. 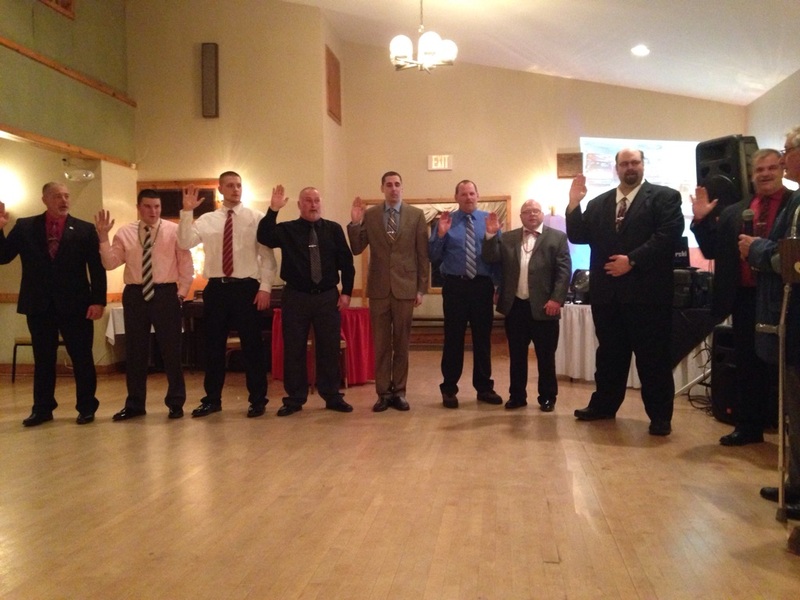 Photo shows the swearing in of Castleton Fire Company Officers. In addition, Michael Shortsleeve was the winner of the Fire Fighter of the year award, and Marianne Carner was recognized for 35 years of service in the Castleton Ladies Auxiliary. The Village Board Meeting scheduled for tomorrow, Monday 2/13/17 at 7:00 PM has been canceled. 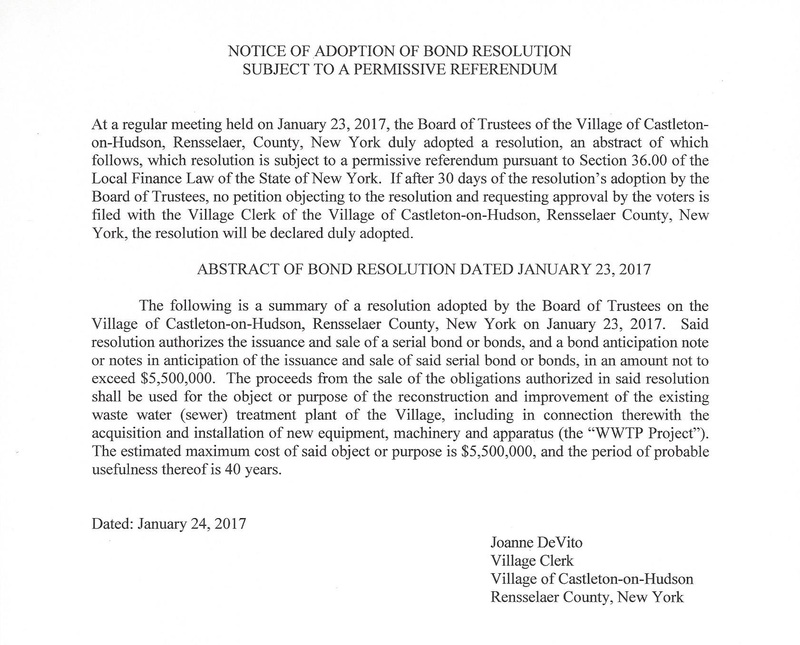 An abbreviated Village Board meeting will be held at 8:00 PM on Wednesday, 2/15/17. The Village offices will be closed tomorrow, Monday 2/13/17 due to the snow emergency. Normal business hours will resume on Tuesday at 9:00 AM on 2/14/17. Cars must be off Village Streets during the snow emergency. Parking can be found at the Fire House, churches and the Main Street parking lots. All spaces in the new First Street lot are also available. Thanks to all the residents who have moved their cars and a special thanks to the DPW for their tireless efforts to get ahead of this storm. There is a Snow Emergency in the Village of Castleton-on-Hudson from 12 Noon on Sunday, February 12th 2017 through 6:00 PM Monday, February 13th 2017. If you are parked on a Village of Castleton-on-Hudson street PLEASE move your car. You can park at the Fire House, the Lutheran church or Sacred Heart. Thank you for your cooperation. Stay safe! Third Place: Robert & Deborah Hammond, 4 North Main Street. Honorable mentions were given to Amy Utter, 92 Seaman Avenue; Michael J. Allard, Jr., 7 Chestnut Street and Larry Hughes, 10 Campbell Avenue. The winner for First Place on Main Street was Chris Carner, 58 North Main Street. Thank you to everyone for taking the time to decorate your home for all to enjoy! Judging will be Saturday, December 10 @ 7 PM.